I am returning to Go after 1 year of not playing, in which I seem to have forgotten a lot - especially Joseki, which I can remember almost not at all. this is a phrase I like. Tazan no ishi - Stones from another mountain. It means to learn from another's mistake. My understanding is that it means that what another might regard as useless (mere stones, common as muck on one mountain) is useful to you (rare jewels on your own mountain). 傍目, okame means onlooker, but 岡, oka, means hill, so okame could be somebody on a hill. 八目 Hachimoku is literally 8 eyes, but 8 is often used to mean all directions much as we say things are scattered to the four winds (eg, 八方美人　or 八方睨みの龍). 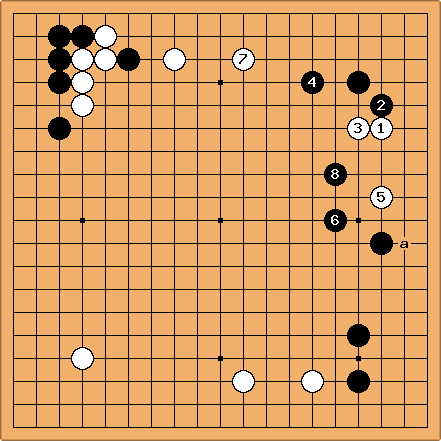 On the other hand 八目 also means eight points in go terms, or even 8 stones. therefore it could be translated as from a hill, you can see in all directions or, with a little leeway, kibitzers' komi is 8 points, or if you don't like the alliteration kibbitzing makes you 8 stones stronger. IRL: 65 wins, 55 losses 3 jigo @ 2 kyu, UK. London Open 2002? 3k, 2 Wins, 2 Losses. Wanstead autumn 2003 2k, 2 Wins, 2 Losses. Letchworth, Summer 2004 2k, 1 win, 2 Losses.